We’re still struggling with fair housing. In so many areas of the United States, segregated neighborhoods are as bad as they ever have been—or worse, much worse—while two million children don’t have homes at all. This made me look back recently at one of America’s greatest plays, A Raisin in the Sun, by Lorraine Hansberry. Sidney Poitier, Ruby Dee, Louis Gossett—these three were in the cast when it premiered at Chicago’s Blackstone Theater in 1959. A month later it became the first play by a black woman to open on Broadway. Universally praised, it won the New York Drama Critics Circle Award, Lorraine Hansberry thus becoming the youngest American playwright, and the first Black playwright, to win it. As the powerful Chicago theater critic Claudia Cassidy wrote, the play—besides being remarkable in itself and in its gifted cast—had “the fresh impact of something urgently on its way.” In 1961 Poitier starred in the successful film adaptation, and a musical version won the Tony Award for best musical in 1973. “Never before, in the entire history of American theater,” wrote James Baldwin, “had so much of the truth of black people’s lives been seen on the stage.” Today the play manages to maintain a kind of “on-its-way” urgency, partly because the social and personal dramas it portrays seem to connect with social and personal problems still at the heart of American society, like the housing issue I began with. Many don’t realize that this play is based on the actual struggles of the Hansberry family to move into a white neighborhood, a struggle that resulted in a suit that went clear to the Supreme Court, which then ruled in the Hansberry’s favor. Hansberry vs. Lee invalidated a racially restrictive covenant barring Blacks from renting or owning property in a Chicago neighborhood. 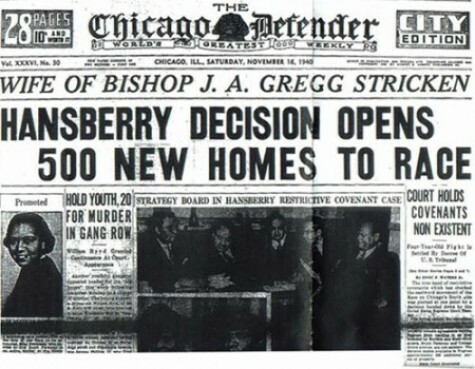 Below is the front page of the Chicago Defender announcing the 1940 decision. The “Hansberry House” at 6140 S. Rhodes has gained landmark status, but segregation always finds a way, and over seven decades later fair, unsegregated housing remains a major American issue. 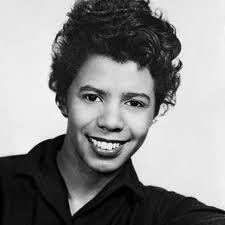 Born in Chicago on May 19, 1930, Lorraine Hansberry died in New York of cancer in January 1965. In her brief thirty-four years, however, she became one of the most luminous figures in Black America and American letters. Among Hansberry’s other works are The Sign in Sidney Brustein’s Window (1964), about the awakening of a Jewish intellectual, and several posthumous works: Les Blancs, The Drinking Gourd, and What Use Are Flowers? When I put together my book Black Writing from Chicago, I used selections from chapters 1 and 3 of To Be Young Gifted and Black, a collage of her fiction, letters, journals and plays. Published in 1969, it contains, I believe, moments of her best work ever. “We were…taught certain vague absolutes: that we were better than no one but infinitely superior to everyone; that we were the products of the proudest and most mistreated of the races of man; that there was nothing enormously difficult about life; that one succeeded as a matter of course. “Life was not a struggle—it was something that one did…And, above all, there were two things which were never to be betrayed: the family and the race. But of love, there was nothing ever said. “If we were sick, we were sternly, impersonally and carefully nursed and doctored back to health. Fevers, toothaches were attended to with urgency and importance; one always felt important in my family. Mother came with a tray to your room with the soup and Vick’s salve or gave the enemas in a steaming bathroom. But we were not fondled, any of us—–head held to breast, fingers about that head–—until we were grown, all of us, and my father died. Her husband Howard Nemiroff scripted To Be Young Gifted and Black for performance and premiered it in New York on January 2, 1969. In the prologue her image and voice are projected, and she says,“I suppose I think that the highest gift that man has is art…I want to reach a little closer to the world, which is to say people, and see if we can share some illuminations together about each other.” In this book we catch glimpses of where A Raisin in the Sun came from and where she was hoping to take her work, and us, from there. We need to keep following. ♦ Go to Emmanuel House/Bryan House, the main page about our family’s foundation that deals largely with housing issues. This entry was posted in Black Writers, Chicago Writing, Diversity & Multiculturalism, Social Change and tagged A Raisin in the Sun, Black Writing from Chicago, Chicago Defender, Emmanuel House, fair housing, Hansberry vs. Lee, Howard Nemirov, James Baldwin, Lorraine Hansberry, Louis Gossett, Ruby Dee, Sidney Portier, Supreme Court, Teaching Diversity, To Be Young-Gifted-and-Black. Bookmark the permalink.